I found the most adorable heart shaped ramekins at my local grocery store and I just had to pick some up. I can’t buy something like that and not share it with my readers in the best way, so here is a perfect Valentine’s Day dessert recipe. Place 5-6 ramekins on a baking sheet and spray with non-stick spray. Fill each ramekin to about half full with fresh raspberries. Mix butter, coconut sugar, flour, milk, baking powder, salt and vanilla extract until a soft dough is formed. Divide the dough into as many as you need for your ramekins. Cover the raspberries in each ramekin with the dough. Mix the warm water and white sugar and pour it evenly over each ramekin. 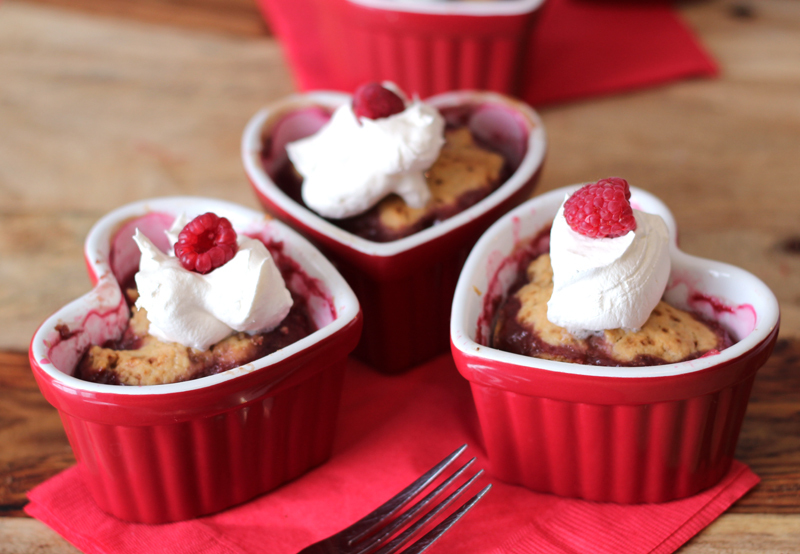 These adorable raspberry cobblers are fresh and sweet, and I like them best when they are still warm. They don’t even need the whipped cream on top, but adding a little whipped cream or ice cream gives it a little extra creamy richness. Love those Ramekins! Where did you find them? Great recipe too! I found them at my local Independent Grocer. They are probably at any President’s Choice store. Thanks will have to see if I can find some! I love your dishes. This looks so delicious. Berry cute and sounds like an easy recipe to make. Love your heart shaped ramekins, so cute and this recipe is easy to make too, sounds very tasty, I’m going to have to give it a try!! Raspberries are my favorite, this looks so good, thanks! Those are such cute ramekins! Love this recipe. The hubby would love this – his fave fruit is raspberries. Looks tres delish! I’m so happy to see that the ingredients for this are easy to find in the store. I want to make this for my hubby and boys for Valentine’s Day! Cute ramekins , I have never heard of coconut sugar I assume regular sugar would be ok! I love these! They are the perfect V-Day dessert! So cute! Sounds delicious too! Great dessert recipe for any occasion. 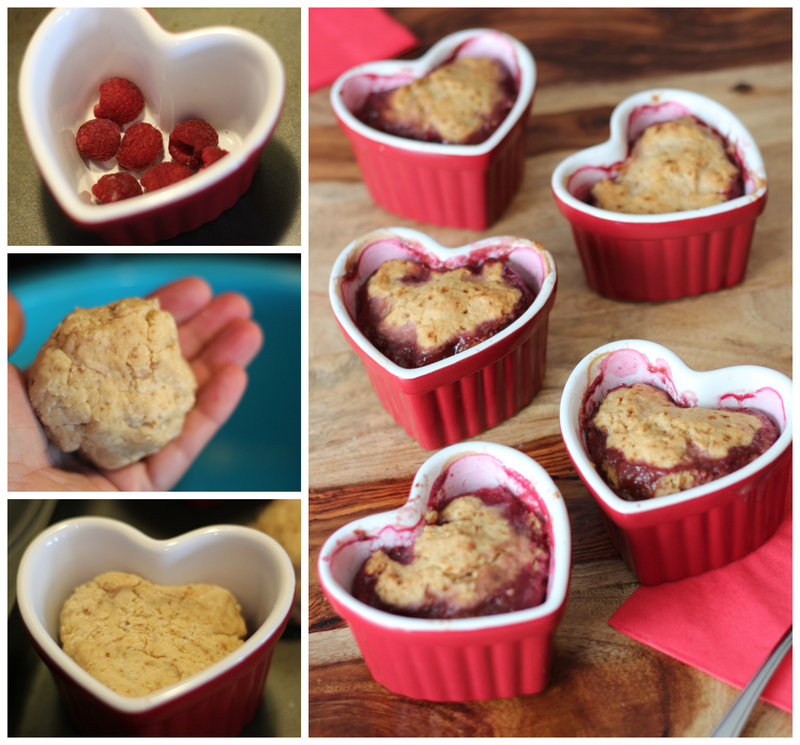 I love raspberries and going to give this a try … cute ramekins! MmmmMmm! I love this idea! I have to search for those heart shaped nappies. The presentation is just as delicious as the recipe. I love these homemade desserts that are not costly but still show love. where did you get your heart dishes? That looks awesome and yummy. Have to find that container now! These look so good! I love raspberries in any way I can get them! Thanks for the recipe! so, so using this recipe for our raspberry bounty next year – I found it too late in the season this year! Those little heart ramekins are adorable! I’ll have to give this recipe a try because raspberries are one of my favorites! I have to give these a try! I just love cobbler. I love your heart shaped ramekins! 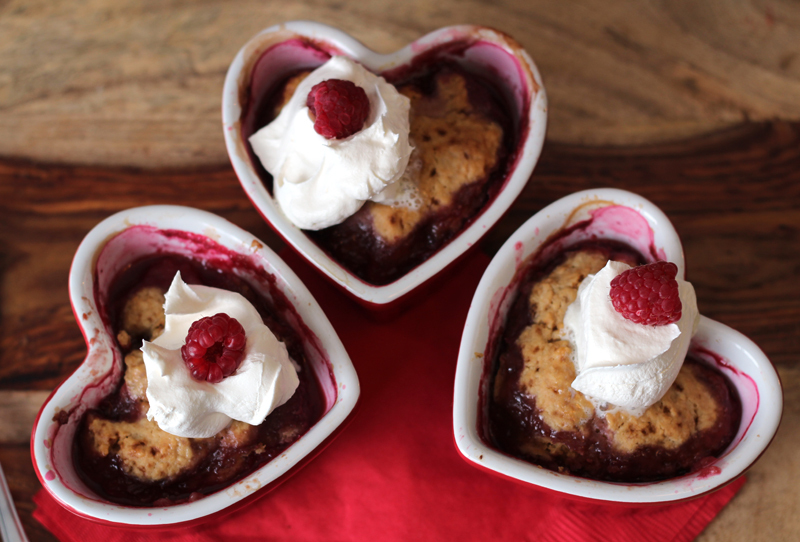 I’m going to have to give it a try,it looks so delicious.Love your heart shaped ramekins. I don’t have any heart ramekins but these were tasty in any dish,thanks ! I’ve never seen a recipe for raspberry cobbler before. I like the idea of this fruit a lot more than peach. Pinning. Oh, I love this for Valentine’s Day!